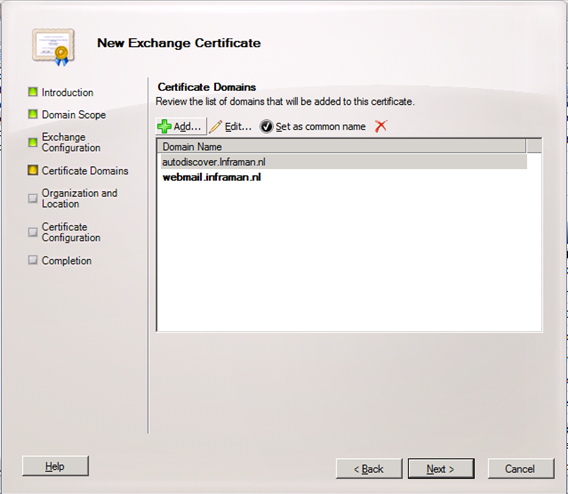 When installing the Exchange Server 2010 Client Access Server, a self-signed certificate, containing just the server name, is generated and installed on the server, and can be used for testing purposes after installing the server. For testing purposes this self-signed certificate also contains the local FQDN in the “Subject Alternative Names” field for testing with Outlook Anywhere. It is naturally a best practice not to use this self-signed certificate in a production environment, but rather to use a third party certificate on the Client Access Server. An interesting alternative to third party certificates is your own Public Key Infrastructure; in other words, the capacity to generate your own certificates. It is a bit out of scope of this book, but you would have to install Active Directory Certificate Services. I typically recommend using a dedicated server for this and not installing the role on a Domain Controller. For a testing environment, this is not an issue. 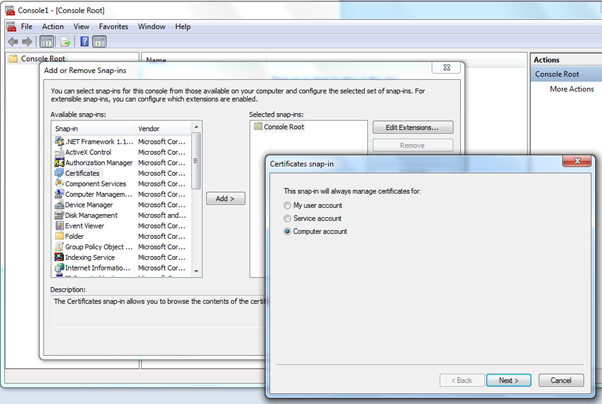 Active Directory Certificate Services can be installed using Server Manager; the base services have to be installed first and additional Role Services can be installed after that. During installation, you have to decide whether you want to install an Enterprise CA (Certificate Authority) which is integrated with Active Directory, or a stand-alone CA. It depends on your own requirements, of course, but for a normal testing environment I typically use an Enterprise CA. Client Access Server (Web Services, Outlook Anywhere, and AutoDiscover). You’ll see an overview of the domain names that will be in the certificate, and the one with the bold typeface is the Common Name (CN) of the certificate. On the completion page, you’ll see the PowerShell command that was used for generating this certificate request. If needed, you can use CTRL-C to copy the contents of this page to the server’s clipboard. Click Finish to continue. After saving the certificate, go back to the Exchange Management Shell (as in Step 4 of the previous instruction-set). 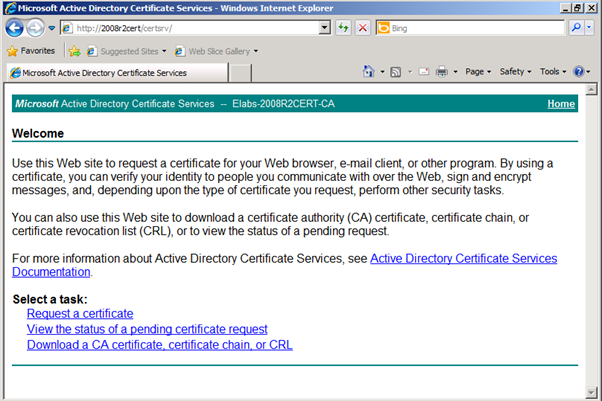 Right-click on the certificate that was requested earlier, and select Complete Pending Request…. Click Yes to continue and, when the wizard is finished, click Finish to return to the Exchange Management Console. The Client Access Server is now secured by an internal Unified Communications Certificate. When you open Outlook Web App using your browser, you can check the certificate and you’ll see the server that has issued the certificate (your internal Certificate Authority), and you can check the Subject Alternative Name entries under the details tab of the certificate’s properties. Now this will work fine for domain-joined clients, as these clients will automatically trust the Certificate Authority that generated the certificate, but non-domain-joined clients will not automatically trust this certificate, so the Root CA has to be imported on these clients. To accomplish this, logon to a domain-joined client or server, open Internet Explorer and navigate to the Certificate Server. 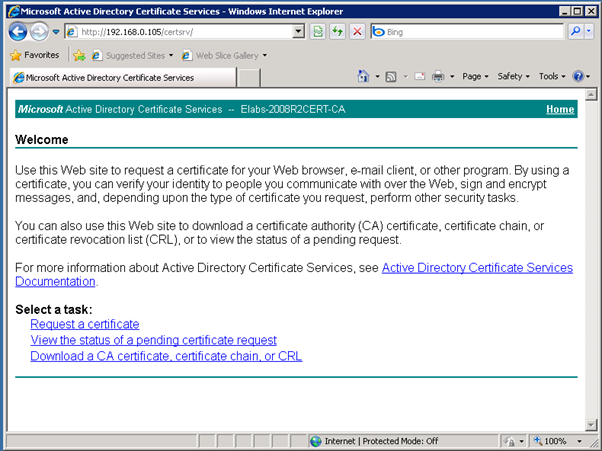 After logging on to the Certificate Server, select Download a CA certificate, certificate chain, or CRL. Follow the wizard and save the certificate chain to the local hard disk, like C:\temp\certnew.p7b. 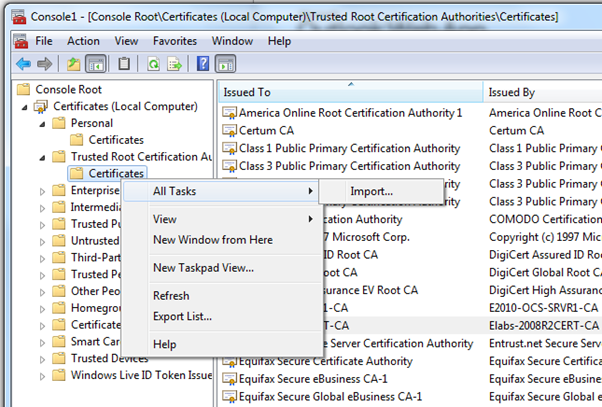 Follow the wizard, browse to the Root CA (C:\temp\certnew.p7b) and, in the Import window, select Place all certificates in the following store and, if needed, use the Browse button to select the Trusted Root Certification Authorities. 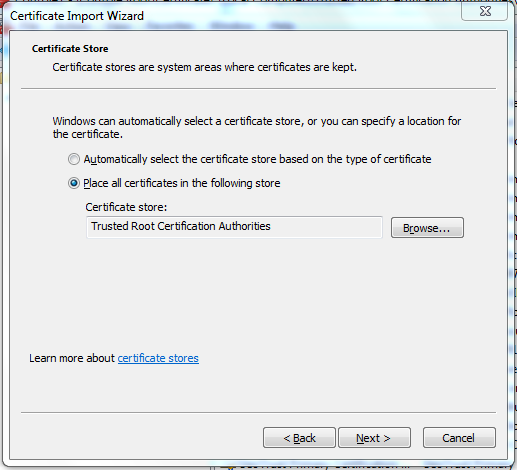 Click Next and then Finish to finish the wizard and add the Root CA to the local Certificate Store. Now when you open Internet Explorer on the non-domain-joined client and open Outlook Web App on the Exchange Server 2010 SP1 Client Access Server, the certificate on this server will be trusted, and the certificate error messages will not be shown. Using this method, you can use an internal Windows Server 2008 R2 Public Key Infrastructure (PKI) for security the Client Access Server without buying a third party Unified Communications certificate.